Seeks continuous improvement through ongoing monitoring and evaluation. 3. A Health Promoting School is one that uses a health promoting schools approach (or whole school approach). The Health Promoting Schools Framework is one which considers the broad health needs of all school community members. These health needs are addressed collaboratively using a combination of strategies linked to the three interrelated components of Curriculum (teaching, learning, professional development); Environment (school ethos, physical, cultural, policies, procedures, School organisation); Partnerships (students, families, staff, professionals, agencies, community and services). 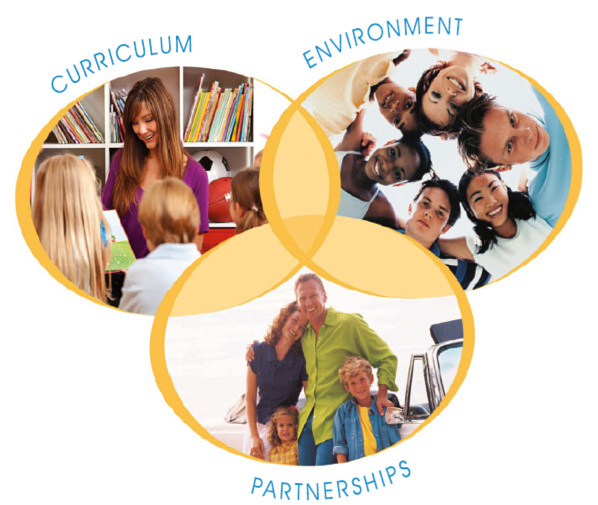 The three interrelated components make up the Health Promoting Schools Framework. The curriculum considers the formal content of teaching and learning approaches, key issues, the developmental and sequential nature of the program, and resources. The school ethos and environment considers the school policy and philosophical support for the health curriculum, approaches to health and wellbeing, school community relationships and the school’s physical environment e.g. school grounds, canteen amenities. School partnerships include family consultation and involvement, community based programs and the development of strong community links to the school.